After a three-month absence, Egyptian satirist Bassem Youssef made his comeback on MBC Masr on Friday with another episode of his satirical show aimed at poking fun at Egypt's current political and social life. At the beginning of the episode “El Bernameg” or “The Program,” Youssef expressed his enthusiasm to be back on air and said he would try to respect MBC’s policy to avoid the show being suspended. “We are glad to be back with MBC and that they still have some money to spend on our program,” Youssef said. “We will try to respect the channel’s policy and MBC’s policy is close to our way of thinking,” he added. 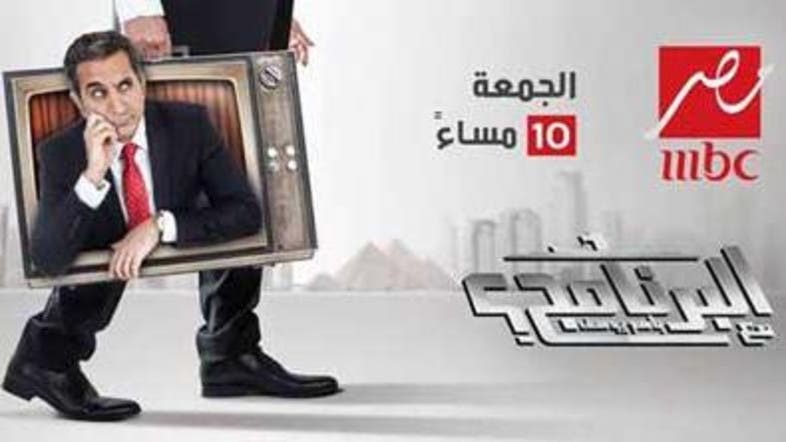 In an attempt to reveal why CBC made its decree, the satirist presented the various criticisms he and “El Bernameg” faced during the three month hiatus. His opponents included members from the Muslim Brotherhood, influential media figures as well as Egyptian citizens in the street. To his defense and to show that there was no logic behind the interruption of his program, Youssef aired a video clip making fun at all Egyptian TV programs which included vulgar scenes - as well as presenters cursing. “Dear logic, where have you been… we’ve missed you. But don’t come, you would be shocked but what is happening here,” the satirist said. Youssef was quick to poke fun over the national obsession of Field Marshal Abdel Fattah al-Sisi even though the satirist said he would not mention his name to avoid problems. “We decided to be able to continue on broadcasting, [but] we will not speak about certain people who are ruling the country at the moment,” Youssef said while showing the shadow of what clearly appeared to be Sisi. “It is not fear, it is respect,” he added mockingly before joking about freedom of expression in the country. “After all media [in Egypt] speaks about what is really going on in Egypt... no?” he asked in an amused tone. Youssef was taken off air after only one episode after the overthrow of Islamist President Mohammad Mursi, as he criticized the military and Sisi, who is seen by many Egyptians as a national hero. When the show was taken off air, Egyptian authorities, who denied having exerted pressure on the broadcaster to act against him, then investigated him on charges of disrupting public order and insulting Egypt and military leaders. But after spending more than 20 minutes trying to avoid speaking about Sisi and politics, Youssef implicitly showed the persistent oppression exerted on the Egyptian media. “We tried to speak about anything else. But the real question is why not speaking about it [Sisi and Egyptian politics]. And if we don’t speak about politics and what is really going on then we are fooling ourselves,” Youssef said on a serious tone. “It will start by not speaking about one thing and then the other and it will never stop. If my program doesn’t suit you then don’t watch [it],” he added. At the end of the show, Cairokee, a famous Egyptian rock band, performed exclusively for El Bernameg and MBC. The satirist has been under scrutiny since his show began in 2011. Youssef was recently named by TIME magazine as one of the 100 most influential people in the world, and was crowned “Man of the Year” at the Esquire Middle East Award on Dec. 5. Due to the success of “El Bernameg” he was the region’s top trending person online in 2013.